Haven’t posted for a while as we’ve been so busy getting ready to go on holidays. Cleaning house (least favourite job) and harvesting and preparing the garden for winter, but that is another story. So… we’ve headed out on holidays. Nothing like advertising it to the world via this blog, but I think we have that covered. The plane left Victoria at 5:30 so Rob got up at 2:30 and I got up at 3 am so we could leave at 3:45 am with a 50 minutes trip to the airport. I have been up until midnight as I was dehydrating tomatoes. Yes, I know… nothing like leaving it to the last minute. But they are happy in their jars and awaiting consumption this winter. Okay… back to the plot. Leaving the house about 3:58 am (we were a little late) Peter picked us up and took us to the airport for which we are eternally grateful. No need to pay for airport parking at the end of the trip. I had prebooked and printed the tickets online so all we had to do when we got to the airport was to head straight for the check-in and that is where we got our first shock. Instead of the normal quick go through security check they have upgraded the Victoria Airport. No longer is it 2 lines but 4 check-in lines and they have a fancy new walk-through metal detector. But, this didn’t mean the line went any faster. As a matter of fact, there was a huge line up waiting to get processes and we were at the end of the line. Note to self: get there sooner next time. As we are waiting in line, we can hear our names being paged. Again… and again… and again. and we were still a long way from the security check. Talk about starting off a holiday on the right foot. Through security, up the stairs and the plane is boarded except for the last rows. We have to wait until we are assigned seats and ended up being the last people on. Really… the last. We had to leave our carry on luggage to be put underneath the plane as there was no room at the inn. Caught out a breath and slept for 1/2 hours only to land in Seattle. Off we get and head through customs. When we went to use the automatic check-in my passport said it was expired. I looked again and I still had until Jan 8, 2018, but apparently, if there are only 6 months left on your passport you have to fill out a customs form with the same information that is on your passport. Go figure. That done, we are now the last in the line again and head down the escalator to go for the next plane. It is going to be a tight timeline without any extra holdups, but of course, there was one more. After customs, you then need to go through another security check. Shoes off, computer out, jackets off and everything out of your pockets. Last of the line and finally we get through that to rush for the unground train to get to our terminal. At this point in time, it was just becoming a comedy of errors. Rob kept checking his watch but I figured that would just make me more anxious. We got to the right section of the airport and ran to our plane and of course it was just about the last one down the long airport corridor. And there standing all alone was one lady that looked like she was packing everything up. We skid to a halt in front of her and bless her, she let us on. Last again. Again our carry on’s had to go into the baggage to be claimed in the baggage area. So much for carry on’s on this trip. We slept most of the way down except for when they brought the beverage service. Rob and I both drank a glass of water and another of juice and ate all the snacks they would give us. Not having any breakfast or water since we left home we were parched and famished. Arriving in Phoenix, AZ the weather was lovely. Warm and overcast we caught the shuttle bus to the car rentals. Having booked the car on points we got a company called “Dollars” as a rental place and never having used them before I have to say that they are a bit of a budget operation. If you are expecting the same service and vehicles as “Enterprise” you will be sadly disappointed. But as Rob said… we’re not buying the car we’re just driving it. As there was no GPS we opted for a map and the one that we received was only of Phoenix which wasn’t a big help. Knowing that we wanted to go to Camp Verde for the night we headed north. We were wanting to go the long route which takes you through Tonto National Forest, but as we didn’t know how to get to that road, we just headed towards Flagstaff. First stop “Jack’s” for a hamburger and water then we tried to find a map but this was a little harder to come by. Places don’t have maps anymore. They have smartphones and GPS’s. But we did find a Walmart to pick up a few necessities. Like a mattress topper, water, cooler, assorted toiletries and some munchies. And… most importantly a phone. This year we got a Cricket flip phone for $19.95 and unlimited phone and text for $25. How cool is that? Walmart set everything up for us and we’ve already talked to the office on it. Headed back on the road again and we are both tired at this point and still no map. Phoenix to Camp Verde is only about an hour and a half on I-17 but our preference is for a smaller country road. Seeing a sign for Visitor Information we stopped in a little town called Black Canyon City. It is one of those towns where they built the highway around it when it once used to go through it and it is rediscovering itself. The Visitors Center was lovely and had MAPS!! Loading up on these Rob got talking to the lady that was manning the centre and I wandered off as I heard some birds. There was a lovely pond out the back and two coots in the water. Happy days! Rob came out and there was a lovely short walk around the pond and a red-tailed hawk flew over and landed in a tree just ahead of us. Lots of little birds hiding in the bushes and it would have been a great spot to go first thing in the morning when they are out and feeding. 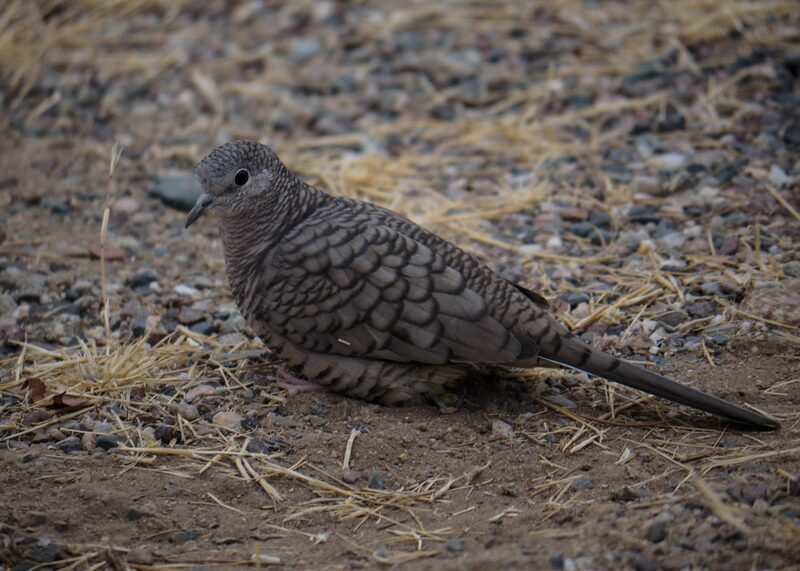 On our way back I saw this funny looking stone on the ground until I realized that it was a little Inca dove just sitting there looking at us. Snapped a picture and off it flew. The lady at the centre had very few visitors today and was anxious to keep us there to visit. Finally peeling ourselves away on we drove. Arriving at Camp Verde we are staying at a motel (Fort Verde Suites) where we have stayed before and the rooms are very nice and they gave us a room with a full kitchen in a separate room for the price of a regular one. Rob has a special touch with the ladies when it comes to hotel/motel rooms. Watched a little TV and headed to a restaurant that is two doors down from the motel, had a lovely dinner (that I didn’t have to cook) and I’m writing this and Rob is sound asleep which is where I will be shortly and it’s only 8:15 pm. Disclaimer: there may not be a lot of pictures on these travelogues as who has time to enjoy the scenery and download and process pictures at the same time. Figured I would just give you updates as they come. Tomorrow we are going to enjoy the area and maybe stay for another night or maybe not… Who knows what tomorrow will bring.